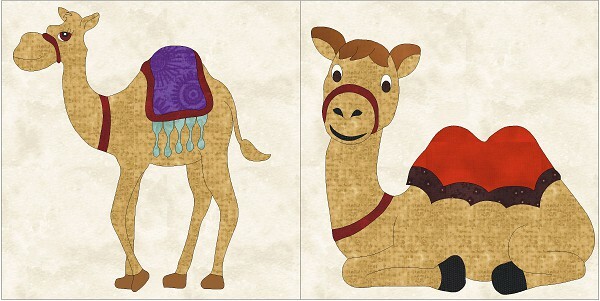 This camels were created specifically for the Oh Holy Night BOTW I featured on my blog during July to November 2015. This standing camel shape is 9x8-inches. This sitting camel shape is 8x8-inches. If you wish to change the size, you will need to either purchase the pj7 file for Electric Quilt so you can adjust the sizes yourself, or you can contact me to resize the pattern. A small resizing fee will be involved. The pdf file is a separate download. There are two files, if you don't want the machine embroidery files, don't download the zip file.